It is a melt in mouth sweet for my Blog Anniversary! Yes, my blog has completed 6 years and stepping into the 7th year and also crossed 21 lakh hits. I thank all my readers, bloggers and friends who spend their time in reading my posts , commenting and trying my recipes. A special THANKS to each and every one of you for your support. Keep cashews in sun until crisp OR dry roast without changing the colour until crisp. Dissolve the crushed jaggery in water, strain and make a soft ball consistency syrup. Switch off the stove. Add cashews to the syrup. Mix well. Grease your hand with ghee and shape to balls when warm. NOTE: Before dry roasting, bring the cashews to room temperature if kept in fridge. Wow!! !.Hearty congratulations on reaching a milestone.Six years in blog world is long and you have been a great source of inspiration to learners and the experienced alike to try out the many delicacies,the common and the uncommon.Best wishes for continued successful journey. 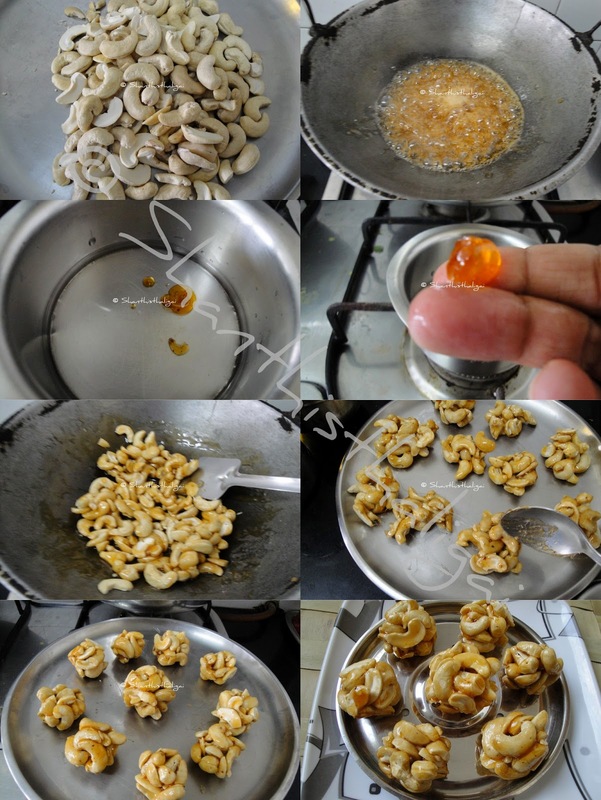 Cashew with jaggery is made in cone form on auspicious occasions.The variant as small balls is good for normal days. awesome and perfect cashew urundai. Hearty Congratulations!!! Yummy Cashew Urundai.